Thailand's lese majeste laws are being overused and abused. The government’s assault on internet service providers sends a chilling message to webmasters and internet companies that they either censor other people’s content or face severe penalties. (New York) – The trial of an internet service provider on lese majeste charges puts Thailand’s web moderators at risk of long prison terms, Human Rights Watch said today. On April 30, 2012, the Bangkok Criminal Court will issue a verdict on charges of lese majeste – insulting the monarchy – against Chiranuch Premchaiporn, the web-board manager of the online news portal Prachatai. Police arrested Chiranuch on March 6, 2009, during the crackdown initiated by the prime minister at the time, Abhisit Vejjajiva, on online media with content that Thai authorities considered to be offensive to the monarchy. 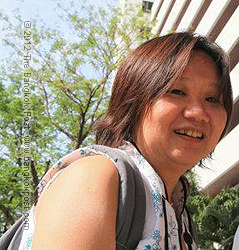 She was charged under the Computer Crime Act as an internet service provider, or intermediary, for 10 alleged lese majeste statements posted by others on the Prachatai web-board between April and November 2008. If Chiranuch is found guilty, she faces a sentence of up to 20 years in prison. The Computer Crimes Act provides that any service provider “intentionally supporting or consenting” to posting unlawful content is subject to the same penalty imposed on the poster, which is a maximum imprisonment of five years. Holding internet service providers liable is a particularly pernicious practice that makes third-parties responsible for the content of others, effectively turning them into the enforcers and censors for the government, Human Rights Watch said. Traditional media also remain at risk from the lese majeste laws, Human Rights Watch said. Somyot Preuksakasemsuk, a well known labor activist and editor, was arrested on April 30, 2011, in connection with two articles he did not write that were published in the now-banned Voice of Taksin magazine. Thai authorities claimed that the articles offended the monarch. The magazine was supportive of the United Front for Democracy against Dictatorship (UDD), known as the “Red Shirts,” who opposed the Abhisit government. Preuksakasemsuk was accused of lese majeste under article 112 of the Penal Code, which carries up to 15 years in prison for each offense. His trial resumed in the Bangkok Criminal Court on April 18 and is scheduled to continue until May 4. The court has denied bail to Somyot eight times since his arrest, including most recently when the Justice Ministry’s Rights and Liberties Protection Department sought to use government-budgeted funds to guarantee his bail applications. Human Rights Watch remains concerned the Thai authorities are using Somyot’s pretrial detention and the denial of bail as a form of mistreatment. Somyot told Human Rights Watch that he had been taken to attend witness hearings in his case in Sa Kaeo, Petchabun, Nakorn Sawan, and Songkhla provinces. He was required to stand up throughout those journeys in an overcrowded truck, with his ankles shackled and without access to toilet facilities, leading to the aggravation of his medical conditions, which include hypertension and gout. “The Thai government’s prosecution of the web moderator Chiranuch and the editor Somyot is another blow to Thailand’s reputation as a country that respects free expression,” Sifton said. In December the government established a so-called “war room” at police headquarters in Bangkok to supervise the surveillance on lese majeste websites. Since then, more than 5,000 webpages (URLs) with alleged lese majeste content have been shut down. “Harsh treatment and severe penalties in lese majeste cases only serves to undermine Thailand’s standing as a rights-respecting state,” Sifton said. BANGKOK - A Thai court on Wednesday convicted an online editor for hosting posts critical of the revered monarchy on her website, but suspended her jail sentence. Chiranuch Premchaiporn was found guilty of failing to speedily delete comments by other people deemed insulting to the royal family from her popular news website, Prachatai. The Bangkok court fined her 20,000 baht ($630). But Judge Kampol Rungrat, while sentencing Chiranuch to eight months in jail, suspended the sentence for a year, saying that she had cooperated with the court and had "never violated the law herself''. "The defendant cannot deny responsibility for taking care of content on her website," he said, adding she was initially given a one-year jail term but that this was cut to eight months for her "useful" testimony to the court. She still faces further charges - at a date to be set - of breaching Article 112 of the Criminal Code which outlaws insults to the royal family and allows for a maximum 15-year sentence for every conviction. Hers is one of several high-profile cases that have stirred fierce debate in Thailand, where authorities are accused of trampling on free speech by exploiting the strict "lese majeste" law against defaming the royal family. On Tuesday, a petition signed by almost 27,000 people urging reform was submitted to parliament in the first mass action of its kind.